You may register now using our on-line registration system. 1. Symposium registration includes participation in all meetings, all printed materials, continental breakfasts, and lunches on Tuesday and Thursday. Three free vendor-sponsored lunches are also available on Wednesday. 2 A Participant is an NEMC Session Chair, a speaker at NEMC, or a member of a TNI Committee or Board. 3 Early bird rates are for individuals that register before June 9. CANCELLATION: If you cannot attend, notification must be received by July 31. You may either send a substitute or receive a refund, less a $75 administrative fee. TNI Standard Volume 1, Module 6 requirements as they relate to the two methods. Experience the best of the Big Easy at our award-winning downtown New Orleans hotel. 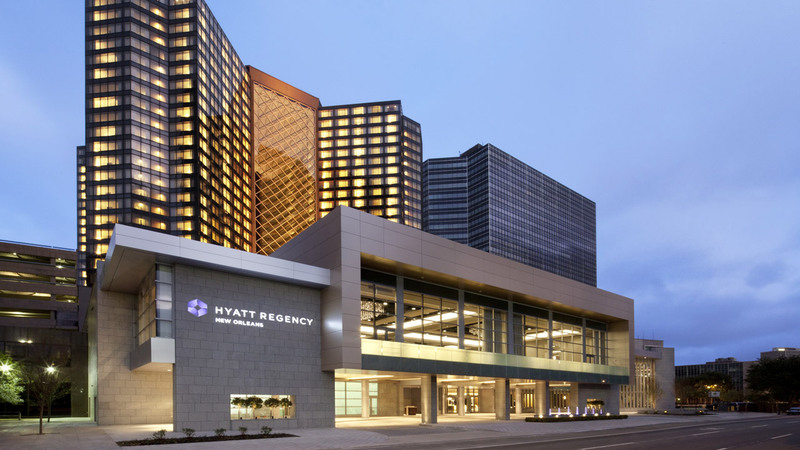 Located right next door to the Mercedes-Benz Superdome, Smoothie King Center and Champions Square, Hyatt Regency New Orleans offers easy access to the area's most popular attractions. Hop on the Loyola Avenue Streetcar, or take a walk to the historic French Quarter, Arts District, Audubon Aquarium of the Americas and the scenic Mississippi Riverfront. Taxi: Taxis are available outside the baggage claim area. Fare is $36 for up to 2 passengers, or $15/person for 3 or more passengers. (25-30 min). Ridesharing: Uber and Lyft offer transportation services to/from the airport. Passengers can meet their service in the Ground Transportation Center located on the first floor of the Short-Term Parking Garage. By Shuttle: Shuttle service is available from the airport to hotels and various other locations in the New Orleans area for $24.00 (per person, one-way). Passengers can purchase tickets at the Airport at Airport Shuttle ticket booths located on the first level throughout the Baggage Claim area. Please visit www.airportshuttleneworleans.com for more information. By Car: Head northeast on Airport Rd, then take Interstate 10 E toward New Orleans. Take I-10 east about 10 miles to exit 234B Poydras St. Continue on Poydras St. 0.5 miles, then turn right onto Loyola Ave. The hotel will be on your right. As in previous years, an exhibition will occur during the conference. Exhibit information for NEMC 2018 will be posted here when available.